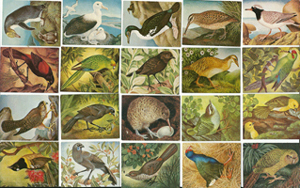 Artist: John Gerard Keulemans - from Walter Lawry Buller's, A History of the Birds of New Zealand, 1888. 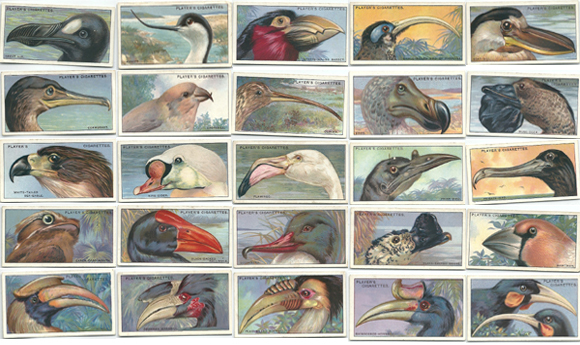 Condition: Excellent, complete set of 50 cards. 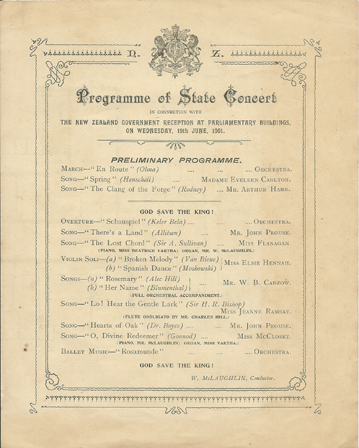 the Duke & Duchess of Cornwall and York to Wellington N.Z. 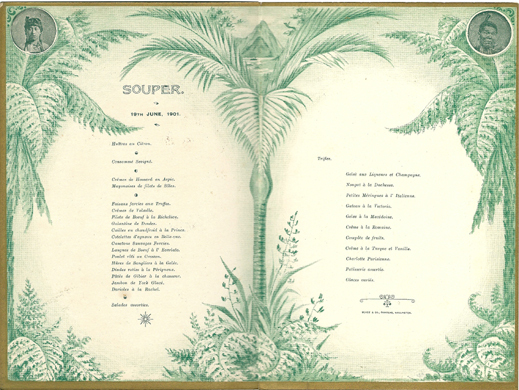 Menu cover shows central text inside the shape of a Maori whare with ornate tekoteko and maihi. A moa stands at the left under a nikau palm, and there is a flax bush at the right. In the four corners are portraits of the Duke and Duchess, Richard John Seddon and Lord Ranfurly. 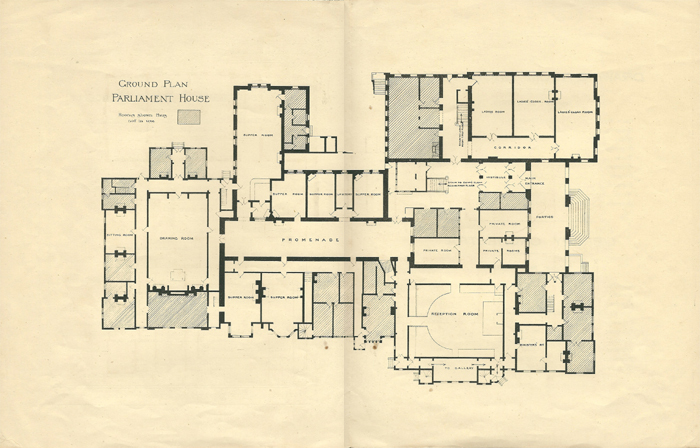 McKee & Co., printers, Wellington. 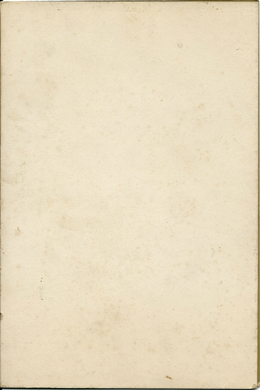 Condition: Very good, faint smuges and some foxing, please see larger image. 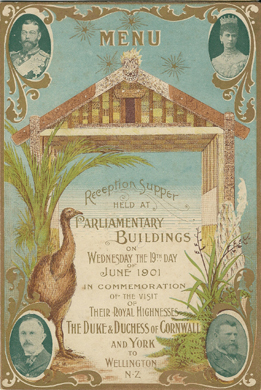 the NZ Government Reception at Parliamentary Buildings, on Wednesday, 19th June, 1901. Condition: Very good. Faint, minor foxing, please see image. 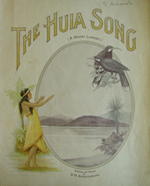 Published and printed in New Zealand by L.T. Watkins Ltd., 1932. 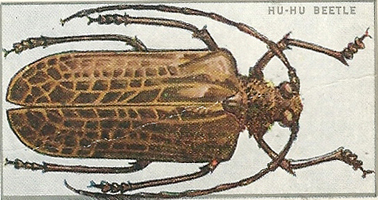 This multi-plate photo-chromolithograph harkens back to the style, layout and typography of the late 19th and early 20thc. The artist, F.H. Shiny, has signed his work to the left of the maiden's heel. Condition: Very good. 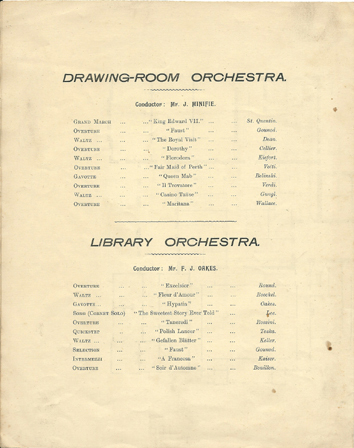 Faint stamp "Music" lower right of front cover. 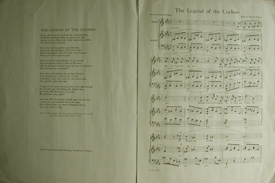 Signed by Beatrice Tombs, wife of Harry H. Tombs, publisher. Condition: Very good. 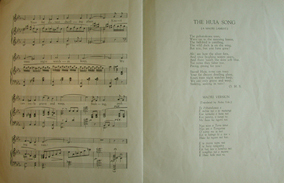 Some foxing, please see larger images. Branch of the Imperial Tobacco Co (of Great Britain & Ireland) Ltd, 1929. 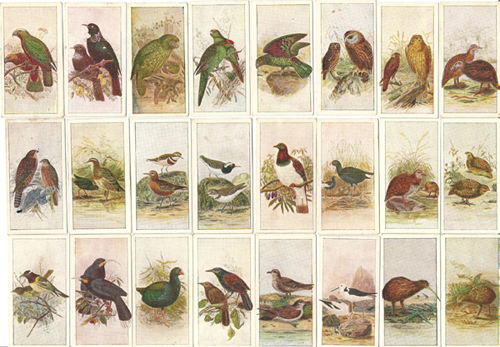 Condition: Excellent, complete set of 50 cards, including the New Zealand Huia. Size: Album, 235mm x 207mm (9 1/4 x 8 1/8inches) approx. ; Each card is 58mm x 45mm (2 1/4 x 1 3/4 inches) approx. Condition: Complete set, all 35 cards attached in album. 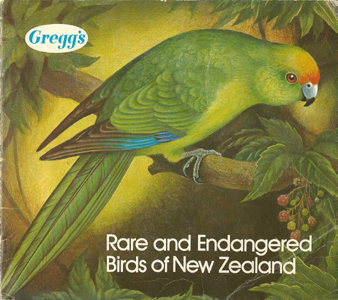 In the 1960s and 1970s, W. Gregg and Co. of Dunedin began producing trading cards in packets of Greggs jelly crystal. 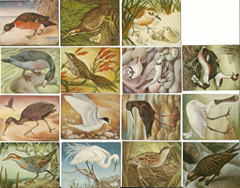 In 1976, however, paintings for a new series, Rare and Endangered Birds of New Zealand, were produced by leading local printmaker and designer Eileen Mayo (1906–1994). Size: Each card is 58mm x 45mm (2 1/4 x 1 3/4 inches) approx. 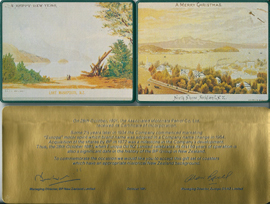 Commemoration gift set of coasters to celebrate Europa Oil NZ Ltd first 50 years in 1981. 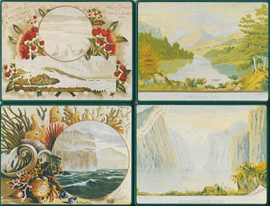 The illustrations on the coasters are taken from New Zealand chromolithograph christmas cards published by A. D. Willis, Wanganui in the 1880s.